The estimated cost of the tax-funded Bus Service Enhancement Programme (BSEP) is around $185,000 per bus per year, after factoring in the resale value of the first 550 buses after the 10-year programme runs out. Of course, that is not a precise apple-to-apple comparison because, in bus contracting, the Government buys and owns all operating assets and infrastructure. An operator, such as Tower, bids to operate a package of services in a competitive tender. The successful operator is then paid the sum it bid for, while the Government collects and keeps fare revenue. Even so, using Tower's operating fee of $556 million as a proxy to the fare revenue of the two incumbents gives us a rough gauge of what it takes to create a sustainable bus operating model. In both cases, an operator makes money by controlling its operating expenses, which include paying the Government to lease its fleet of buses. In the current regime, neither SBS Transit nor SMRT has been able to cover bus operating expenses with fare revenue alone. In principle, the new contracting model allows an operator to focus on meeting service standards without having to worry about capital expenditures and fare revenue. Managing all three objectives, it seems, has been a juggling act made impossible by the fact that fares are controlled by the Public Transport Council. Clearly, if fares remain unchanged, the Government will end up subsidising bus operations in a big way. That, however, has been the premise of bus contracting. London, which started bus contracting more than 30 years ago (when the late prime minister Margaret Thatcher began privatising nationalised institutions), has seen its bus subsidies climbing year on year. According to a 2013 government report, bus subsidies have risen from £24 million or 2p per passenger trip in 2001 to £393 million (about S$814 million) or 17p per passenger trip in 2012. But supporters of the system point out that service standards have risen, too. And that many commuters travel for free. These include those over 60 years, the disabled, and children up to 15. Those between 16 and 18 pay concessionary rates. That is what Singapore is trying to achieve. In the bus contracting model, at least half of all buses will arrive within 10 minutes, up from 30 per cent today. And intervals between buses will not exceed 15 minutes on any route, down from 30 minutes now. While that may not sound like much, the standards are a feat that requires a disciplined and motivated staff to pull off. At the same time, an operator has to be efficient, as that affects how much profit it makes at the end of the day. But to start off, an operator like Tower will have to offer competitive wages to build up its pool of drivers. This is not just because drivers are always in such short supply, but SBS Transit and SMRT - which will lose a number of routes to Tower from next year - are also likely to retain as many of the good ones as possible, so that they can be redeployed to other routes. So, this competition for drivers will be positive for the profession - just like the liberalisation of the taxi industry some 10 years ago has proven to be beneficial to cabbies. 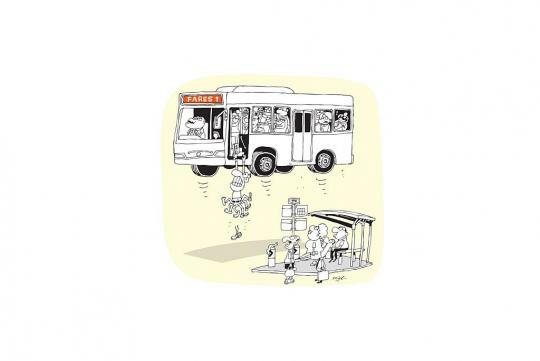 From a policy perspective, the contracting model is a more transparent and elegant way of doling out subsidies than the multi-billion-dollar BSEP, which is often misconstrued as financial assistance for bus companies. But will bus contracting be better for commuters, and will it be worth the substantially higher cost it entails? Well, that really depends on whether the new service standards will be met. If commuters need not wait more than 15 minutes at a bus stop, it will be money well spent (even if frequencies of 10 minutes and less are common in London). Because today, bus intervals here are often long or erratic. And if service frequency increases, the level of crowdedness will naturally decrease. Hence, bus travel will also become more comfortable with the new operating model, if all goes according to plan. To make this happen, the regulator has to be watchful. Otherwise, we may end up with an operating model that merely enriches transport companies. Right now, the only missing piece in this grand ambition is a bus timetable. Several cities publish bus timetables, which allow commuters to plan their day with precision. They provide more certainty than online or smartphone apps, which, even if they are accessible to everybody, merely alert commuters to when the next bus will arrive. As it stands, government subsidies for buses are set to rise with the contracting model. While future contracts may be less costly as competition hots up, it is clear buses will eventually get nearly as much state support as trains have been getting. And, in all likelihood, fares will rise too, to reflect the improved service. As Mr Ee put it, there is no free lunch.